Ushandball.org Reports- The beautiful setting of the Los Caballeros Sports Village will be the backdrop for the 65th USHA National Four-Wall Championships from June 9-14. Hosted by the Southern California Handball Association, players and families will enjoy fantastic hospitality along with the great SoCal weather. This year’s tournament adds Big Ball Open Doubles to the mix (More Below) along with the traditional Open, Amateur and Masters divisions. All singles play will begin on Tuesday, June 9th (with the exception of Women’s & Juniors divisions). All doubles will end on Sunday, June 14th. (If you’re estimating when you’ll play, a round of 16 doubles division would start on Thursday, etc.). On Thursday, a fun Mexican fiesta, complete with a taco truck will be offered as the traditional Thursday night banquet where we will present some special awards (we have also reduced banquet fees for guests). There are two host hotels offering special rates for players. The Avenue of the Arts Wyndham and Holiday Inn also offer transportation to and from the club on a limited basis, as well as the Orange County Airport. Both have an early departure fee to consider. Be sure to mention U.S. Handball. 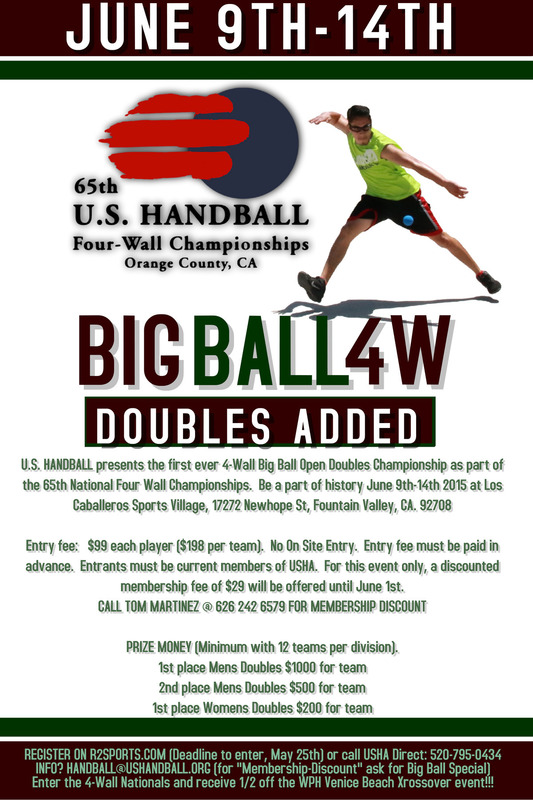 THE UNITED STATE HANDBALL ASSOCIATION Presents “….the first ever 4 wall Big Ball Open Doubles Championship” as part of the 65th National Four Wall Championships! Be a part of history, June 9th-14th, 2015, at Los Caballeros Sports Village, 17272 Newhope St., Fountain Valley, CA, 92708. For this event only, a discounted membership fee of $29 will be offered until June 1st.